With the clocks going back this weekend, I searched for a short story about clocks and came up with "The Clock" (also known as "The Clock That Struck Thirteen") by Sholem Aleichem. It's an interesting tale with a strong parable feel to it. Perhaps clocks are just so rich a symbol that we just know it's probably meant to mean something else. In this story, Reb Nochem is known to have the most respected and accurate clock in town. Others set their watches by it. However, it soon becomes apparent that the clock is slightly fast. Later it begins to chime 13 times instead of twelve. 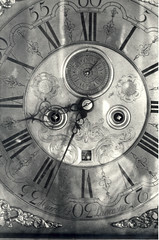 Despite all his efforts, the clock can only be fixed for a short while before it acts up again. Eventually it crashes. At first I was taking this to be about the inevitability of death. But then I read this interpretation, which takes the story to be about tradition no longer working in a modern environment (more specifically, it looked at Jewish traditions). I quite liked this interpretation when I reconsidered how the clock was behaving. It wasn't losing time, it was gaining it. It wasn't coming up short on its chimes, it was adding them on. I think that's a telling clue as to what Aleichem was getting it. Clever, in any case.